Steve Coppell led Crystal Palace to fifth in the Second Division and unearthed one of the club's greatest-ever players. Coppell sold Jerry Murphy to Chelsea but in the summer period and signed Stephen Ketteridge from Wimbledon, Andy Higginbottham from Cambridge United and a striker called Ian Wright from Greenwich Borough. TONY MAHONEY joined Grays Athletic and the injury-plagued Kevin Mabbutt left the club. Palace got off to a bright start to 1985/86 with wins over Shrewsbury and Sunderland in the league and a first leg Milk Cup triumph over Charlton. A draw with Carlisle followed but the month ended with a narrow defeat to Huddersfield. A Milk Cup draw with Charlton ensured Palace made it safely through to the next stage on aggregate. However back in the league, the Addicks were triumphant and Palace also lost to Norwich then Manchester United in a Milk Cup first leg game. There were stalemates with Stoke and Fulham but victory over Millwall boosted spirits. Ten-man Palace came back from a goal down to beat their arch rivals. Full-back Paul Brush signed from West Ham. Palace announced that they were to groundshare with Charlton in a seven-year deal worth at least £65,000 a season. The Eagles beat Blackburn, Oldham - Wright leapt off the bench to score his first Palace goal - and Middlesbrough but lost to Portsmouth and Hull in the league to end the month in ninth place. Man Utd's second leg victory in the Milk Cup meant they went through to the next round. 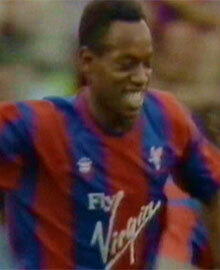 Palace suffered Full Members Cup losses to Brighton and West Brom. There were wins over Grimsby, Leeds and Barnsley, a reverse at Bradford and draw away to Sheffield United. Palace signed off the month in sixth place. Just one win was achieved in December - versus Hull - there were losses against Shrewsbury and Wimbledon and a draw with Sunderland. The Eagles end 1985 in sixth. Palace's FA Cup campaign finished prematurely with defeat to Luton. The Eagles won all three points against Charlton - the first time the sides met as groundsharers - but lost out to Brighton and Norwich and played out a goalless draw with Huddersfield. Terry Howard signed from Chelsea on loan. Just two fixtures in this month - a draw with Carlisle and win over Blackburn which saw Palace remain in sixth spot. Steve Hardwick joined from Oxford United on loan, while Terry Howard moved to Chelsea on loan. Victories over Fulham, Brighton and Middlesbrough then losses to Oldham and Stoke meant Palace were five points off the top three automatic promotion places in seventh place. Gary Locke moved out to Sweden, while Steve Galloway signed for Cambridge United on loan. A successful month would see Palace in with a chance of breaking into the top three. They registered four wins (Barnsley, Bradford, Portsmouth, Leeds) and the 4-2 win over Barnsley was the highest number of goals scored for more than three years. There was also a draw with high-flying Wimbledon and defeats to Grimsby and Millwall. These results were not good enough to make the top three automatic promotion spots and Palace finished the month in fifth. A draw with Sheffield United in their last game of the season gave Palace a final place of fifth - two places off automatic promotion.